In French they are called datte. In German, Dattel, in Italian, Dattero, in Chinese, Hai zao. Dates are one of the world’s oldest cultivated fruits. Dates are an oval shaped fruit that measures 2.5 to 5 cm long and 1.5 to 2.5 cm in diameter. Dates contain a large single seed also called the “pit” that runs the length of the fruit. Before dates ripen they range in colour from bright red to bright yellow. As dates ripen, their colour changes to a dark brown and they shrivel up, similar to a prune. Dates ripen in four stages: unripe; full size and crunchy; ripe and soft; and ripe and sun-dried. Each stage of the ripening process has a special Arabic name and each is regarded for it’s unique culinary properties. 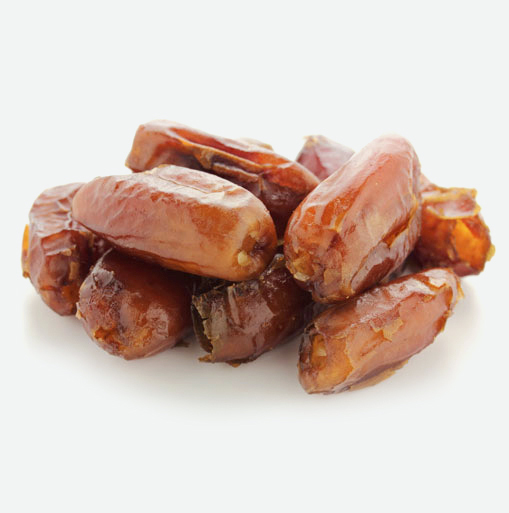 Dates are extremely nutritious, containing more natural sugar than any other fruit. The fruits contain protein, Vitamin A, and some of the B vitamins. Being high in potassium, they can be used, instead of bananas. Fresh dates need to be placed in a glass dish such as a pie plate and then covered well and refrigerated until you are ready to use them. These fruits are perishable and should be used within two or three days of bringing them home. Rinse the dates under cold water and pat dry before consuming them. Dried dates, as long as they remain well sealed, will keep for up to a month in a cool, dark place, or in the fridge. Dried dates also freeze well, making this an easy way to prolong their shelf life (as long as they are sealed tightly). Dates can be eaten raw or cooked. Incorporate these fruits into stews, sauces, curries and meat dishes. Dates are delicious if you serve them alongside cheese or baked into squares, cookies and cakes. To pit dates, all you need to do is to slice the date length-wise and remove the pit. To prevent the knife from sticking to the fruit, periodically dip the blade of the knife in a glass of warm water. Stuff dates with walnuts or almonds and some brie. Bake them in the oven at 350F for about 8 to 10 minutes. These make delicious desserts or appetizers.